A dental implant is much like a natural tooth, which has a root in your jawbone, topped by a crown that you can see. When you need an implant, our on staff periodontist will insert a metal post beneath your gum and into the bone. It fuses to the bone in your jaw and acts like the root of a tooth. Then, either Dr Akhtar or Dr Asbelle will make a replacement crown on the post, designed to blend in with the way your own teeth look and feel. 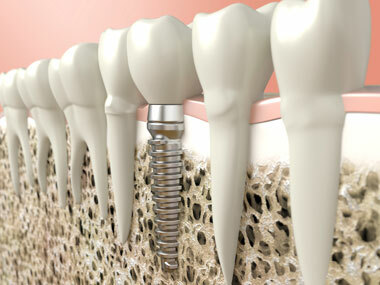 Dental implants also can be used to anchor dentures. An innovative and permanent solution to provide natural-looking replacement of missing teeth, dental implants have changed the fields of cosmetic and restorative dentistry in many exciting ways. Please contact Dental Center West to schedule a consultation for this effective treatment. Another alternative to replace missing teeth is a fixed bridge. This is a restoration that replaces or spans the space where one or more teeth have been lost. 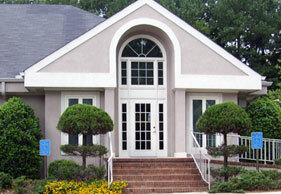 A fixed bridge is bonded or cemented into place. Your appearance, dental health and the proper functioning of your mouth are all important reasons for wearing a fixed bridge. It helps maintain the natural shape of your face and may help support your lips and cheeks. As its name describes, a removable partial denture readily can be taken out of the mouth for cleaning. Although removable partials generally are less expensive, fixed bridges, when indicated may feel more stable and comfortable. Depending on your situation, however, a removable partial may be for you. Removable partials usually have replacement teeth attached to gum-colored plastic bases connected by a metal framework. They may attach to your natural teeth with metal clasps or esthetic clasps. Crowns on your natural teeth may improve the way a partial denture fits your mouth. Call Dental Center West today at 803-643-9595 and ask about our tooth replacement options, and get started on reshaping your smile today!